With Kings of Egypt II, Basquiat showed he knew how to paint a solid sequel. Technically the second installment in a series of three paintings, everything about Kings of Egypt II feels like the art world’s equivalent to a Hollywood follow-up: there are more colors, more symbols, and, most importantly for Basquiat, more skulls than the first. And yet it remains true to the themes that were established in Kings of Egypt I. 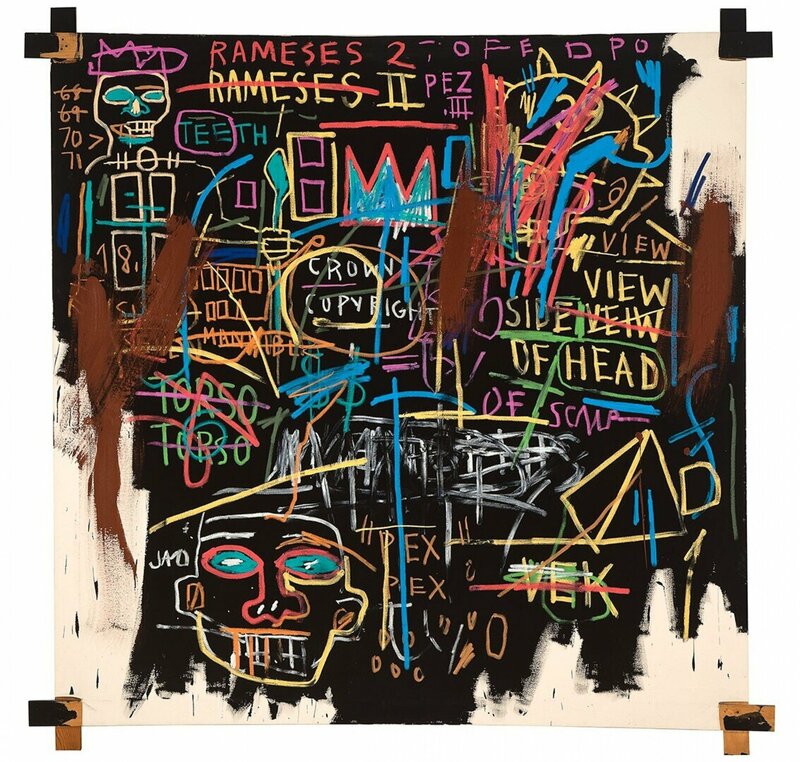 The invocation of an Egyptian Pharaoh’s name, symbols suggestive of hieroglyphics, and the presence of Basquiat’s iconic SAMO crown are all here. As a sequel, it brings to mind Emperor Strikes Back and Terminator 2 in its success. Thankfully, Basquiat never made any prequels. Ramses II, the name that graces the top of the painting, is known by Egyptologists to be one of the most successful pharaohs in the history of Egypt. He financed an unparalleled amount of buildings during his reign, and he even built his own city as the new capital of Egypt, which may or may not be referenced by the pyramid in the bottom right corner. At least nine other pharaohs took Ramses’ name as a sign of honor. He was an industrious Pharaoh, and rather egotistical, calling himself the king of kings. Later on, he would become synonymous with collapse following immense power, because of the Percy Bysshe Shelley poem Ozymandias, which uses the Greek variant of his name. And while this would be a fitting metaphor for Basquiat, who lived fast, died young, and had perhaps the fastest pauper to prince story in all of art history, there appears to be something far more interesting going on here. Basquiat is noted for his sharp views on the politics of his time, and often drew critical attention to cultural and political dichotomies, such as that between white and Black. As an artist known for appropriation (in one of his notebooks, he even quotes a line from the bible with his own copyrighted sign), it seems Jean-Michel Basquiat was also interested in reclamation. He felt very strongly about the historical narrative attributed to the Western world. Rather than Egypt being the cradle of western society, he saw it as part of Black history. The Kings of Egypt series as a whole seems to be an attempt at visualizing his thoughts by blurring Egyptian history with the visual history of street art and graffiti. Interestingly, it was painted around the time of his first solo show, and just before the height of his career. A few years later, he would paint Untitled (The History of Black People), which furthers the themes seen here by presenting both Egyptian imagery with traditional African iconography. According to some art historians, it solidified his rejection of history as we know it. Yet his work always remains elusive, like the lives of pharaohs invoked in Kings of Egypt II. If nothing else, he really did make a solid, solid sequel. "The Artist." Basquiat.com. Accessed October 2018. http://basquiat.com/artist.htm#. Hoban, Phoebe. "SAMO IS DEAD: The Rise and Fall of Jean-Michel Basquiat." New York Magazine, 26 September 1988. Dorman, Peter F., and Raymond Oliver Faulkner. "Ramses II." Encyclopædia Britannica. September 12, 2018. Accessed October 19, 2018. https://www.britannica.com/biography/Ramses-II-king-of-Egypt. Basquiat, Jean-Michel. Kings of Egypt I. 1982. Okpewho, Isidore, Carole Boyce Davies, and Ali AlʼAmin. Mazrui. The African Diaspora: African Origins and New World Identities. Bloomington, IN: Indiana University Press, 2002.